Date night returns after a “summer travel hiatus”. We are always looking for a celebration, and when our dear friends and frequent Date Night guest stars Claudia and Randy invite us to celebrate Claudia’s birthday, we jump at the chance. Better yet, Randy has picked tonight’s location and made reservations, so all we have to do is show up on time and give our car to the valet. Welcome to South Sandy Springs. Double Zero is located in “South Sandy Springs” on Roswell Road, just north of the perimeter. 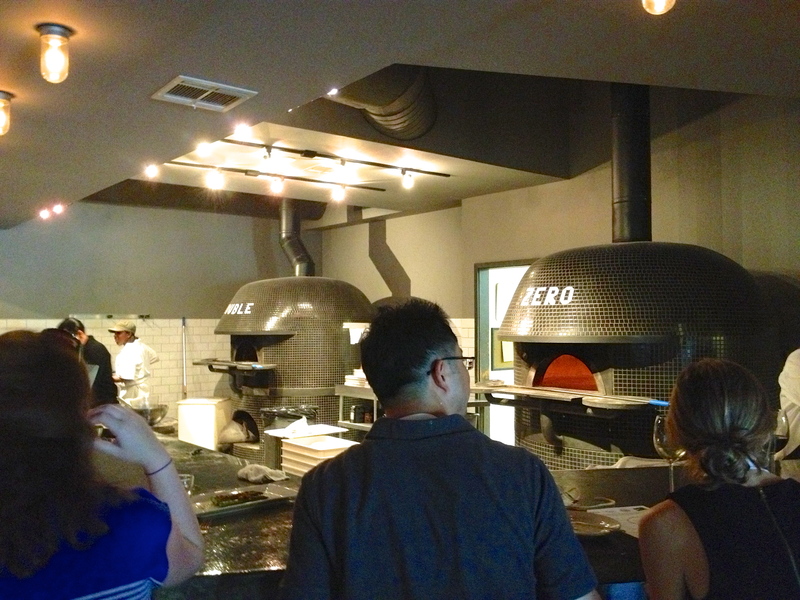 We walk in and are greeted by an attractive blonde and two tile-covered, wood-fired Italian ovens. This is going to be a good night. We are stoked to see what comes out of the ovens. 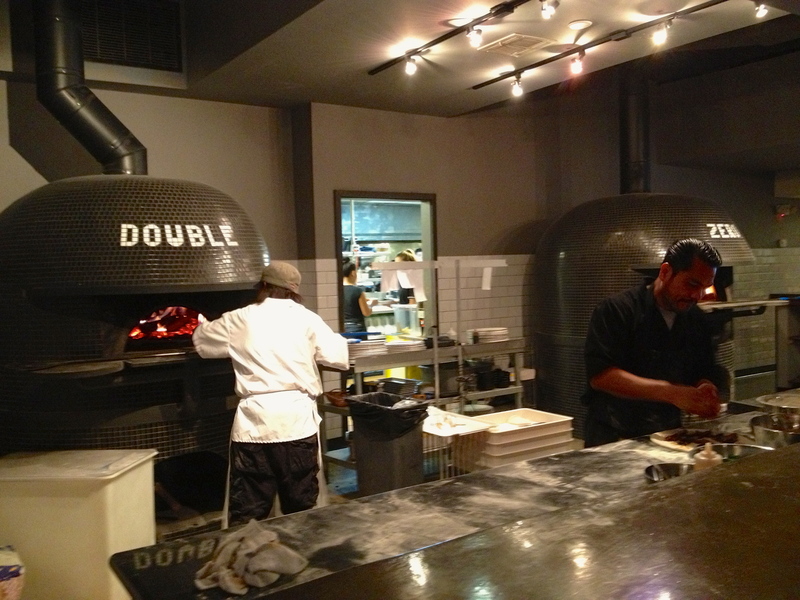 You can sit at a bar around the ovens and watch them make your dinner. Our table is in a secluded corner of the dining room. 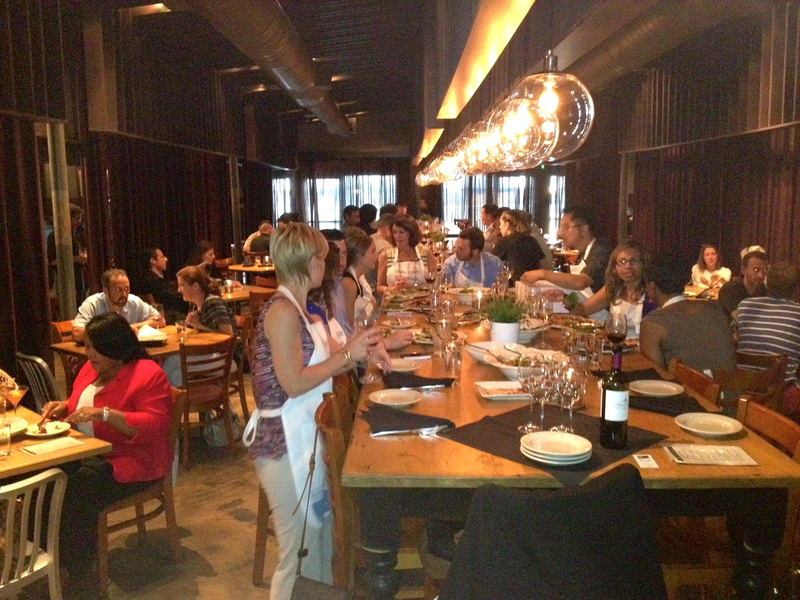 There are long tables for large parties, and this joint is rocking. The economy is good in Sandy Springs. Our waiter Claudio comes to the table to introduce himself. Claudio is Claudia’s waiter on her birthday. How does that happen? First up, beer! 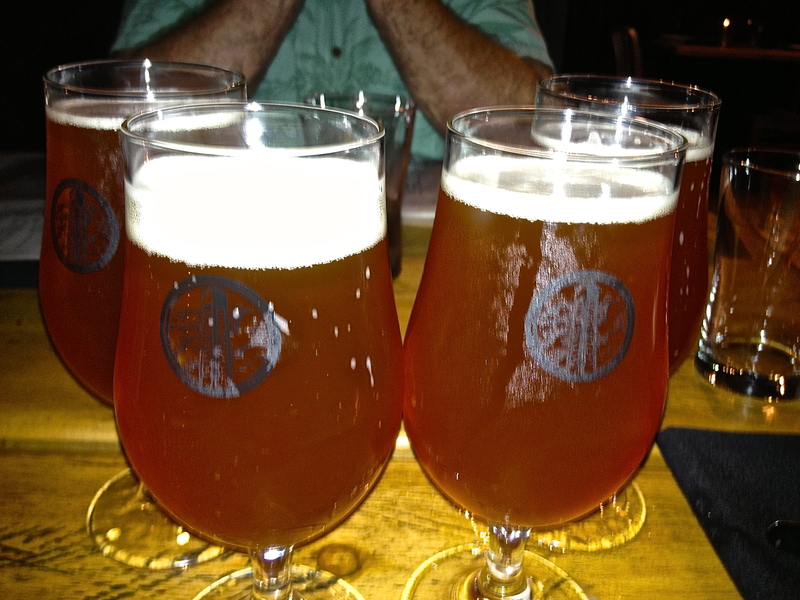 There are only four drafts on the menu, but one of them is a favorite, Ommegang Rare Vos. Slightly out of focus, and we haven’t even had a sip. Rare Vos appears frequently on the Date Night table. It’s a good Belgian-style ale for the summer–slightly fruity, slightly cloudy, and very refreshing. There is a larger assortment of bottled beers, and an extensive wine list, but we didn’t want to pay $12 for a glass of wine. 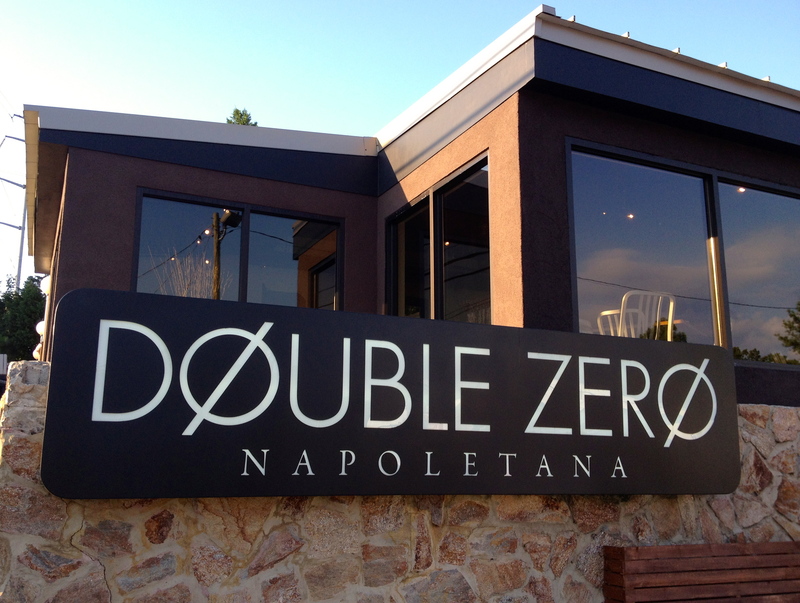 The Double Zero menu is so good that we all have a hard time deciding what to order. Bread is available by request, so that is an easy choice. It’s crusty on the outside and soft on the inside. Make sure you request yours when you go. We finally decide on two appetizers. First out are the lamb meatballs. They slow-cook the meatballs and then flash-fry them for a crispy shell. Delicious. We share the cheese plate as well. 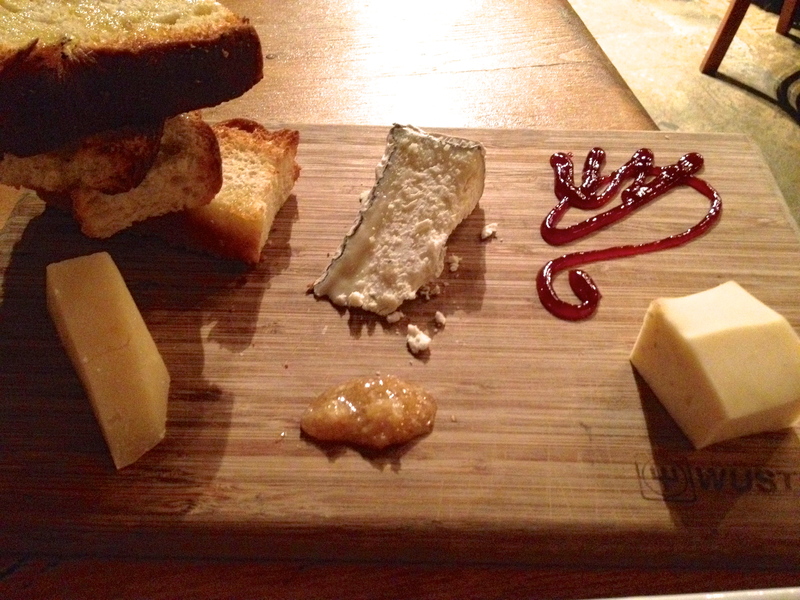 This one has Pecorino, Humboldt Fog, and Tellegio cheeses on the platter. Raspberry jam and honey complete the plate. 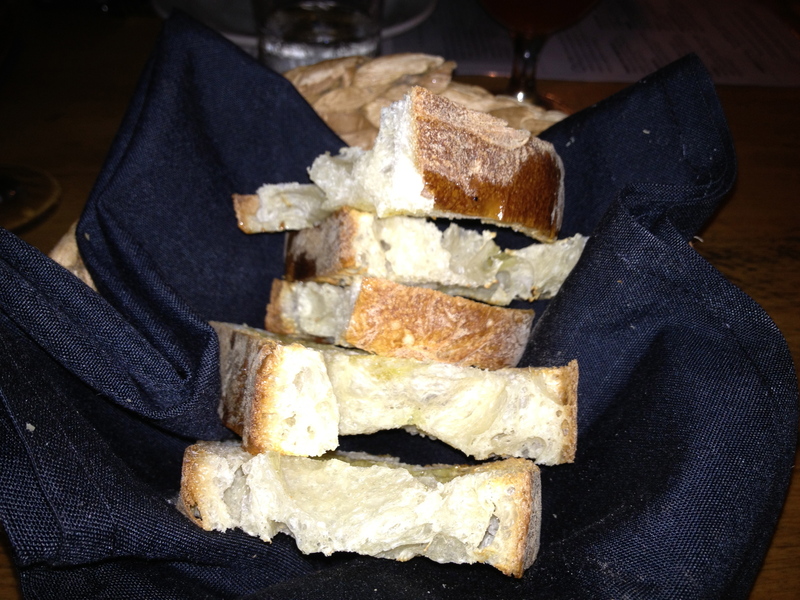 The bread on the cheese board is different from our earlier bread. This one is more like cake than bread and the sweetness offsets the rustic taste of the goat, cow and sheep cheeses. Again, it’s hard to order our entrees because there are so many ways you can go here. Do we get pizza, pasta (half orders of pasta are available), or go for something big like pork tenderloin. We all go in different directions. Eve has just heard a radio piece on quinoa, which probably influences her choice. 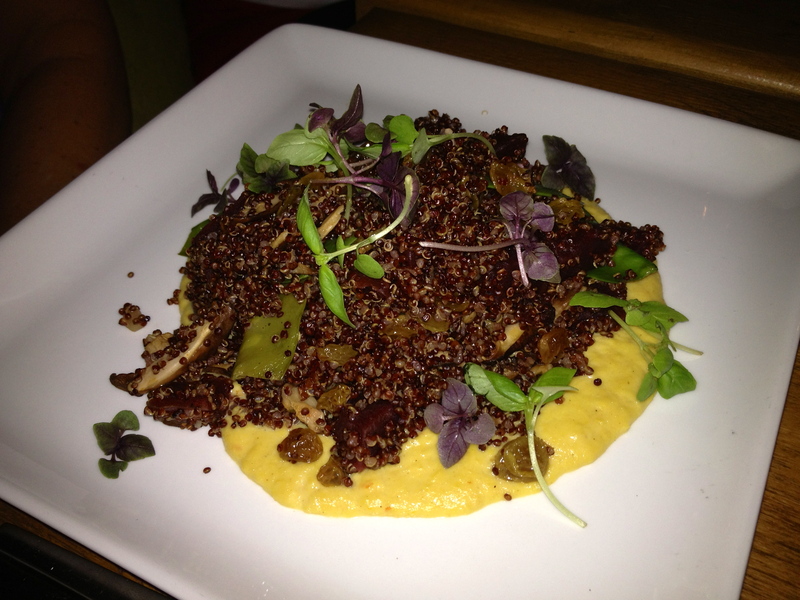 Now you know what quinoa looks like. It’s a seed, not a grain and this seed comes with beets, snow peas, raisins, and mushrooms. It’s good, but it didn’t come out of that wood-fired oven in the front. My dinner does. 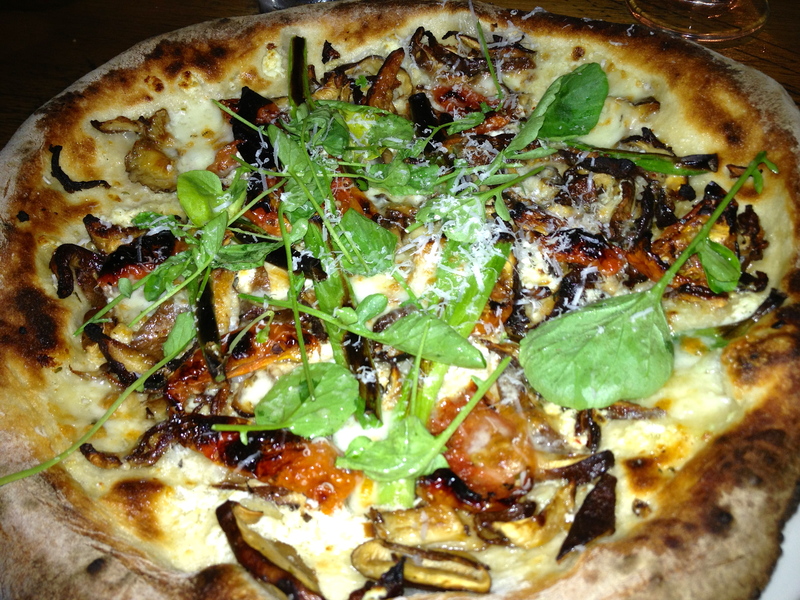 The mushroom pizza is a white pizza and has two kinds of mushrooms and cherry tomatoes on top. The green stuff is watercress. This is an amazing pizza, almost up there with the pizza at Antico. In fact, it may be just as good. Here’s something fun–they don’t cut the pizza for you. Instead, they give you a pair of scissors with your pizza and you cut your own. There are two specials on the menu tonight, and our guest stars each get one. Sea bass for the birthday girl. Claudia tries the sea bass and is nice enough to share. 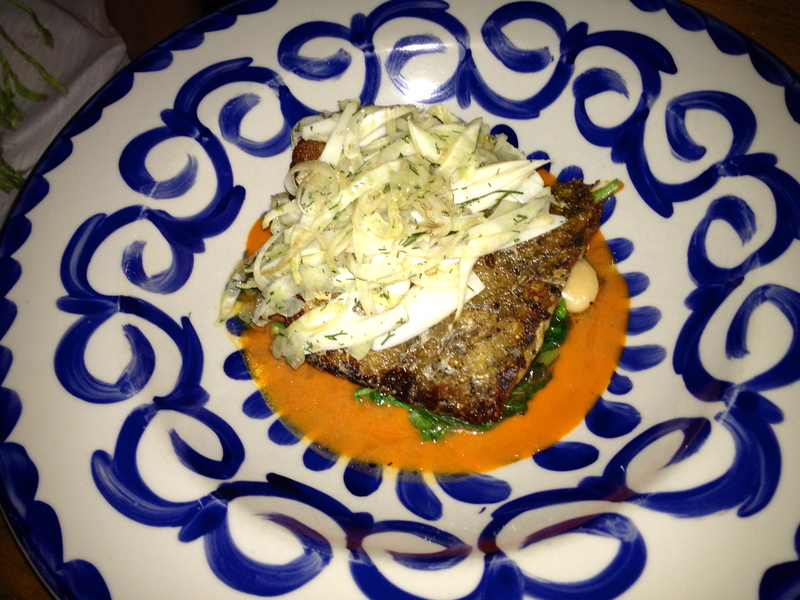 Sea bass is always so good, and it’s a special dish that you should eat on special occasions like your birthday! Now that’s a hunk of meat. 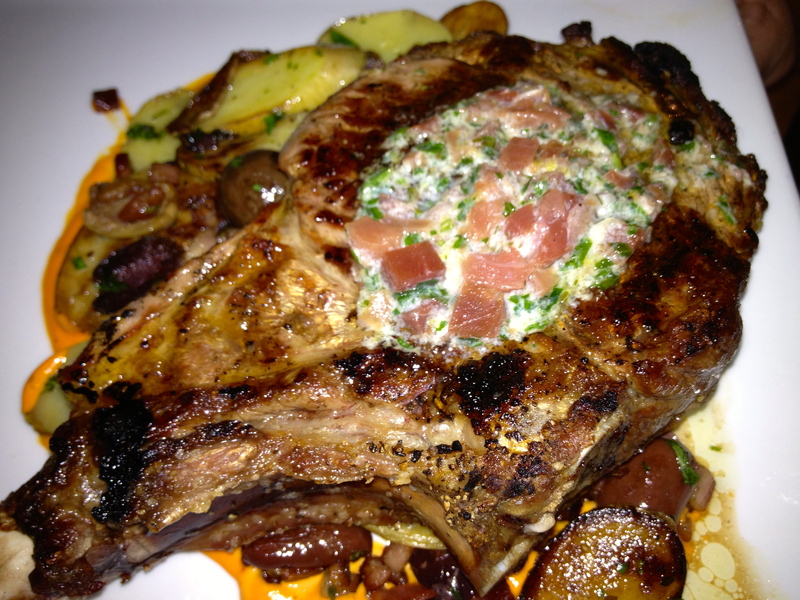 Randy goes for the special veal chop and we get a bite of that too. 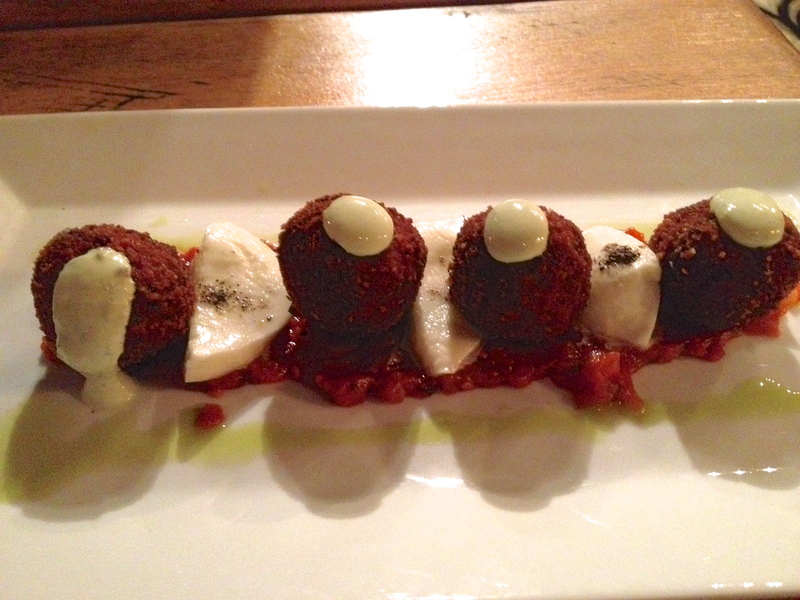 It is served over potatoes that are mixed with olives. We think he liked it because the only thing left on the plate is the bone, and a few olives. Yes, we are too full for dessert, but we would have liked to try the berry assortment, which is warmed in the wood ovens and then topped with gelato. Instead, Eve has brought cupcakes for the birthday celebration. The cupcakes are from Gigi’s. We split each one four ways. 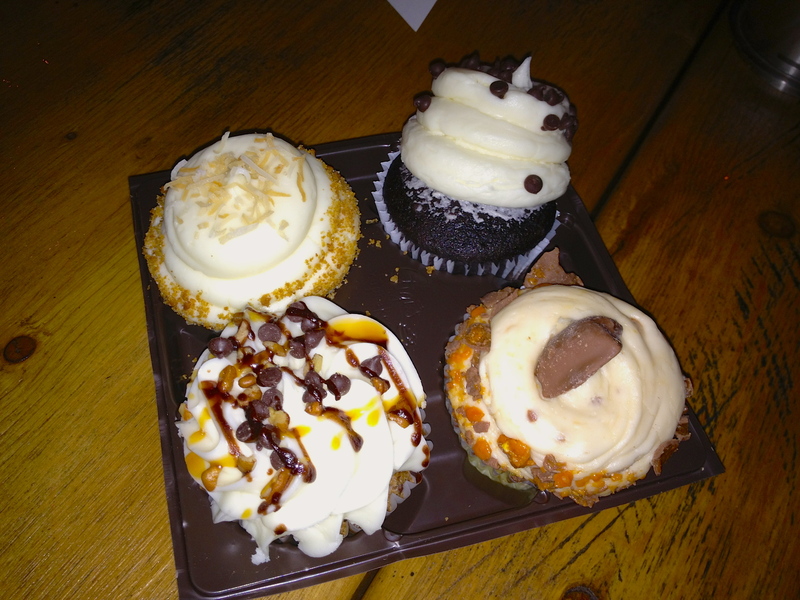 From what I can remember, they are (clockwise from upper left), coconut cream pie, chocolate with white chocolate icing, Butterfinger and bourbon pecan. Even Claudio gets in the birthday spirit, bringing us each a small glass of champagne. He’s a class act and has taken really good care of us tonight. What a way to end a memorable Date Night. The Bottom Line on Double Zero: It’s expensive, but with food and service like this, well worth it. Go here to celebrate your next special occasion.